The Unmanned Aerial Vehicle craze is real and its momentum heightens with every conference and news article. The possibility it offers for different professions is becoming a reality with the integration of various software technology offerings. Seeing real time enhancements to various industries is proof that UAV’s are having a real-world impact for many sectors, and the Engineering and Geomatics Profession is now seeing a major impact. Especially in the land and energy relates sectors. The WestLAND Group’s FAA part 107 licenses allows the company, under the direction of our Professional Licensed Surveyor’s, to harvest this technology. WestLAND Group, has always been at the forefront of cutting edge technology, and introduced UAV’s in its work processes several years ago. UAV’s have now become another technology tool in WestLAND’s Survey Engineers toolbox, like the Robotic Total Station, and GPS have done. In addition to obtaining amazing color imagery and producing real-time quantities for mining operations in a matter of minutes, WestLAND has introduced the use of UAV’s in the Site Development, Construction, and Utility industry providing real-time analyses, inspections, and planning all at a fraction of what it used to cost and with the added benefit of safety enhancements. WestLAND has developed techniques and policies using UAV’s in its engineering and mapping process. And the use of UAV’s in the site planning process, construction inspections and progress documentation, change detection, high resolution aerial imagery, 3D mapping, utility and infrastructure inspections and monitoring, has stepped up WestLAND’s game which may still just be touching the tip of the iceberg for utilizing this new tool in our profession. UAV’s are a “non-destructive” surveying tool and can be operated from a safe distance which makes obtaining data in or around hazardous areas, environmentally sensitives sites, and unstable terrain, safe and economical. UAV’s provide new opportunities to enhance processes and deliverables. Whether the project is a small commercial, industrial, residential development or hundreds of miles of lineal pipeline or transmission electric lines, UAV’s offer quick and efficient aerial photography to support multiple activities. All of these technological developments serve to enhance how we collect data and what we can and should expect from these tools as a Professional Organization. Call us and we will show you how, why, and when, to incorporate the use of UAV’s with the integration of other tools in your next project and see firsthand WestLAND’s effectiveness and efficiencies. The value that we deliver comes from years of experience delivering on a broad range of geospatial and engineering solutions from planning, design, through as-builts to completion. All our operators are FAA Part 107 certified and have degrees in Geospatial Engineering, all supervised by Professional Licensed Surveyors. Our “Aerial Solutions Teams” are comprised of these operators and experienced field surveyors who fully understand what the clients are looking for. This sets us apart from many start-up companies and puts us in an elite group of UAV professionals. The “sky’s the limit”, pun intended. For this project we were afforded the opportunity by one of our clients to provide a verification survey and prepare stockpile volume calculations for an aggregates stockpile that was incomplete in the data set returned from a mobile lidar survey that had recently been conducted. Early in our planning we recognized the opportunity to both deploy our UAV in conducting the field work and to perform a comparison between data collected using terrestrial laser scanning and data generated from aerial photogrammetry (obtained using our in-house UAV system). 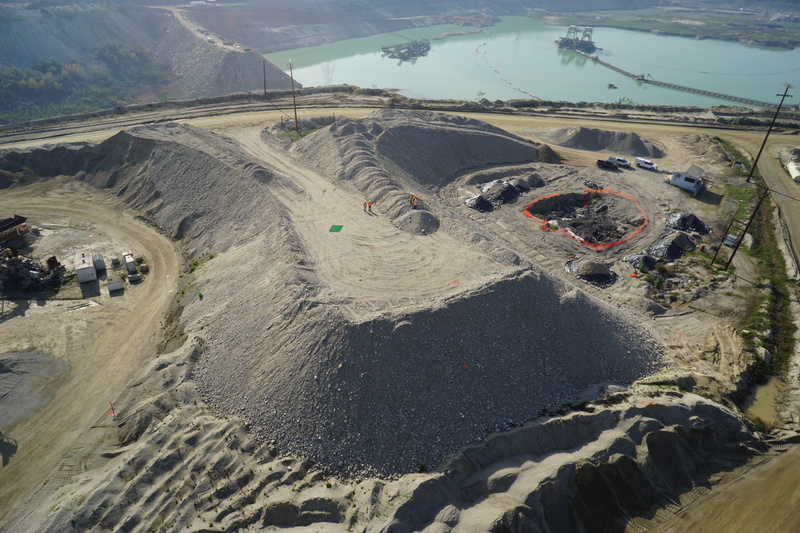 In addition to preparing volume calculation for the approximately 50,000 cubic yard stockpile (see photo below) that was requested by the client, we selected a relatively small stockpile (about 6,000 cubic yards) to perform the comparison survey. As part of the data comparison process, we set numerous control check points that were surveyed with a total station and RTK GPS. These control points were then captured as part of the laser scanning control and as control targets visible in the UAV photography. The data was reviewed, analyzed and processed back in the office, then we generated a TIN surface of the stockpile from each data set. When we compared the final results of the stockpile volumes we realized that the results obtained from the photogrammetry were superior to that obtained from laser scanning. It was apparent that the aerial view provided a more complete surface, revealing irregularities covering the top surface of the stockpile that could not be captured by the laser scanner that was setup on the ground. Utilizing UAV’s for stockpile volume calculation projects is quickly becoming the industry standard. This approach results in obtaining more complete data in a shorter amount of time as compared to terrestrial scanning, mobile lidar or other more traditional methods.